The stylish Bucket Bag, featuring original hand-printed fabric. The bucket bag can be worn on your shoulder or cross body. It’s the perfect size for the essentials whether traveling or out shopping and will even fit your ipad. 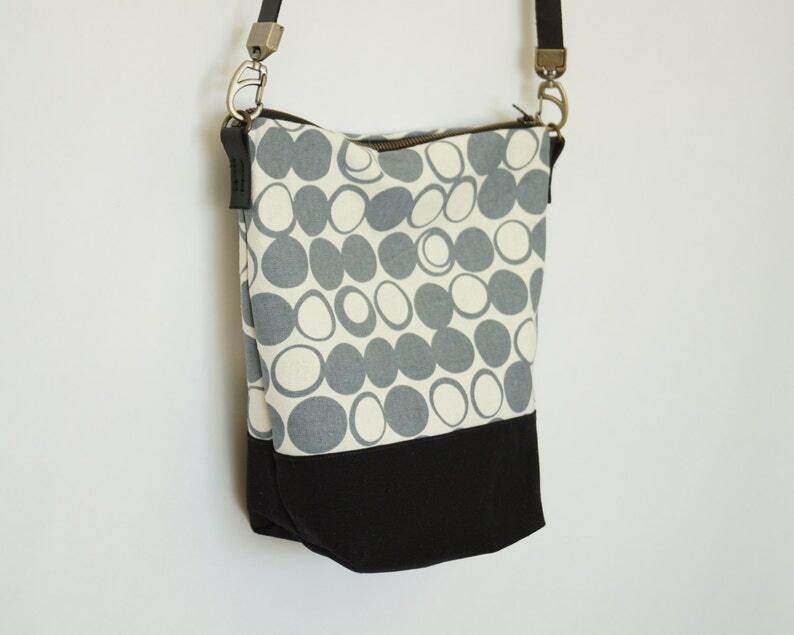 The purse combines an original Cloth+ink print with a sturdy black organic canvas for the bottom gusset. Finished with an internal pocket, antique brass zipper and black leather strap. The ever changing night sky inspired this original print titled ‘Moon Phases’. The moon’s changing phases have been captured and dotted randomly to form this geometric print. Shown here in a ‘Slate’ gray. Strap Length: Approximately 44” (112cm) - If you require a longer or shorter strap please contact me with the details prior to purchase. - Construction: machine sewn with professionally finished seams, canvas gusset for support, sturdy metal rivets for strap attachment, antique brass zipper and internal pockets.